The same DC machine can be used as a motor or generator. Therefore, theoretically, construction of a DC motor is same as that of a DC generator. An electric motor is an electrical machine which converts electrical energy into mechanical energy. The basic working principle of a DC motor is: "whenever a current carrying conductor is placed in a magnetic field, it experiences a mechanical force". The direction of this force is given by Fleming's left-hand rule and its magnitude is given by F = BIL. Where, B = magnetic flux density, I = current and L = length of the conductor within the magnetic field. Fleming's left hand rule: If we stretch the first finger, second finger and thumb of our left hand to be perpendicular to each other, and the direction of magnetic field is represented by the first finger, direction of the current is represented by the second finger, then the thumb represents direction of the force experienced by the current carrying conductor. Above animation helps in understanding the working principle of a DC motor. When armature windings are connected to a DC supply, an electric current sets up in the winding. Magnetic field may be provided by field winding (electromagnetism) or by using permanent magnets. In this case, current carrying armature conductors experience a force due to the magnetic field, according to the principle stated above. Commutator is made segmented to achieve unidirectional torque. Otherwise, the direction of force would have reversed every time when the direction of movement of conductor is reversed in the magnetic field. This is how a DC motor works! According to fundamental laws of nature, no energy conversion is possible until there is something to oppose the conversion. In case of generators this opposition is provided by magnetic drag, but in case of dc motors there is back emf. 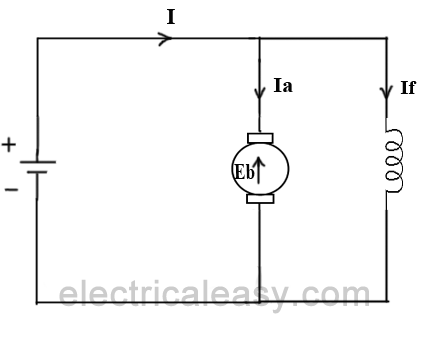 When the armature of a motor is rotating, the conductors are also cutting the magnetic flux lines and hence according to the Faraday's law of electromagnetic induction, an emf induces in the armature conductors. The direction of this induced emf is such that it opposes the armature current (Ia). The circuit diagram below illustrates the direction of the back emf and armature current. Magnitude of the Back emf can be given by emf equation of a DC generator. Magnitude of back emf is directly proportional to speed of the motor. Consider the load on a dc motor is suddenly reduced. In this case, required torque will be small as compared to the current torque. Speed of the motor will start increasing due to the excess torque. Hence, being proportional to the speed, magnitude of the back emf will also increase. With increasing back emf armature current will start decreasing. Torque being proportional to the armature current, it will also decrease until it becomes sufficient for the load. Thus, speed of the motor will regulate. On the other hand, if a dc motor is suddenly loaded, the load will cause decrease in the speed. Due to decrease in speed, back emf will also decrease allowing more armature current. Increased armature current will increase the torque to satisfy the load requirement. Hence, presence of the back emf makes a dc motor ‘self-regulating’. See the chart of classification of DC machines here.